user warning: Table 'drupalgastronomer.comments' doesn't exist query: SELECT COUNT(*) FROM comments c WHERE c.nid = 153 AND c.status = 0 in /home/dgabriner/gourmetgastronomer.com/modules/comment/comment.module on line 992.
user warning: Table 'drupalgastronomer.comments' doesn't exist query: SELECT c.cid as cid, c.pid, c.nid, c.subject, c.comment, c.format, c.timestamp, c.name, c.mail, c.homepage, u.uid, u.name AS registered_name, u.signature, u.picture, u.data, c.thread, c.status FROM comments c INNER JOIN users u ON c.uid = u.uid WHERE c.nid = 153 AND c.status = 0 ORDER BY c.thread DESC LIMIT 0, 50 in /home/dgabriner/gourmetgastronomer.com/modules/comment/comment.module on line 992. INGREDIENTS: -1 medium yellow onion, sliced -1 large russet potato, cubed -1.5 cans vegetable broth -1.5 pounds of zucchini, pealed and chunked -1 teaspoon salt -2 teaspoons yellow curry powder -1/2 cup heavy whipping cream DIRECTIONS: *Put slices of onion and potato cubes in vegetable broth in a big pot and bring to a boil, covered. Continue to boil for another 10 minutes, then add chunks of zucchini. *Boil potato, zucchini, and onion until tender to the touch of a fork. *Add salt and curry. 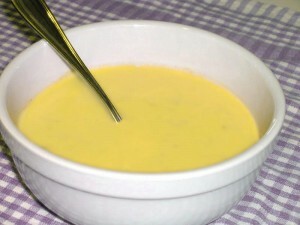 *Put mixture into blender and blend until creamy. (A food processor can also be used.) *Return the blended soup to the pot. *Add cream. *Heat until piping hot and enjoy. This simple recipe tastes like it took all day to cook, and is great at any time of year. If more zucchini flavor is desired, peal can be left on.